Sprouts are great for adding a bit of flavor or crunch to a salad or sandwich, and can really boost the nutritional value of your meal. For example, one cup of bean sprouts provides 119% of your daily Vitamin C, and broccoli sprouts are considered by nutritionists to be a "cancer-fighting superfood" due to high levels of phytochemicals (mainly sulphorophanes). 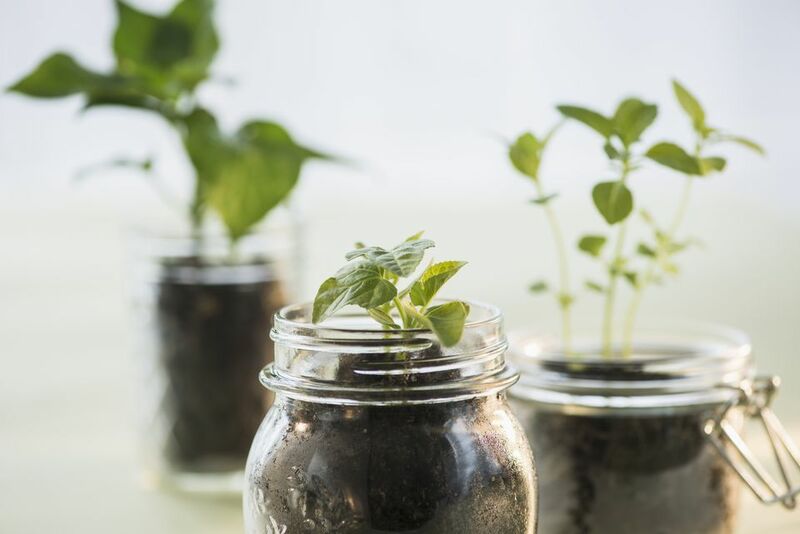 When you consider the additional fact that sprouts are the single most simple crop to grow and that anyone can grow them in approximately four inches of countertop space, we can't imagine why there isn't a ​sprout jar in every kitchen. The important thing to note about buying seeds for sprouting is that you should look for seeds specifically labeled as "sprouting seeds" or "for sprouting." The reason behind this is that they have been cleaned well and are pathogen-free. Sometimes you can find packets of sprouting seeds in garden centers, but if not, check your favorite seed catalog; many now sell sprouting seed. As far as varieties go, you may be surprised at how many types of veggies you can eat as sprouts. Most of us are familiar with alfalfa sprouts and bean sprouts but consider radish sprouts, beet sprouts, pea sprouts, and sunflower. In general, any plant from which you might eat the stems and leaves is a good option for sprouting. Plants from which you only eat the fruits (such as tomatoes and peppers) won't work. Place one to two tablespoons of seeds in your jar, and cover with approximately two inches of warm water. Let this sit overnight. Drain the water, using a fine sieve or cheesecloth. Rinse the seeds by adding water to the jar, swishing the seeds around, and draining. Repeat twice a day, every day until your sprouts are the desired size. This will take anywhere from three to seven days, depending on the variety of sprout you're growing. Sprouts are best when they're still fairly small and just starting to turn green. Store your sprouts in a covered bowl or food storage bag with a paper towel inside to absorb excess moisture. Use the sprouts within a week. While growing sprouts in a jar is a very easy method, there are also other gadgets you could buy for your sprouting operation, including multi-tiered sprouters, jar lids with different size strainers for easy rinsing and draining, and even sprouters that automate the rinsing process for you. It can be as simple as elaborate as you want. Either way, growing sprouts is a great way to get a little more nutrition into your diet.